Lieutenant Cherry remained in prison for two months after Lee’s surrender at Appomattox. His brother James had surrendered with the rest of the Army of Northern Virginia on April 9, 1865, and received a parole to return home to Georgia. William Cherry was fortunate to have survived Union retaliation. Mauriel Joslyn tells the story of the last six months’ imprisonment of The Immortal 600 in painful detail. The pages from which I take information from her book Immortal Captives appear below in parentheses. There is far more in the book, especially the quotations from diaries and memoirs of Confederate and Union soldiers that amplify almost every page. Here are the main facts. On October 21, 1864, the officers remaining on Morris Island left the stockade and marched to two dismasted hulks. There were 549 prisoners remaining of the 600 who had left Fort Delaware in August. General Grant had stopped all exchanges of prisoners to take advantage of the Southern shortage of manpower. Two steamers towed the hulks to Fort Pulaski at Savannah. At first, the prisoners received good treatment. The new guards were the 157th New York Infantry, which had fought the Confederate army and respected their opponents. 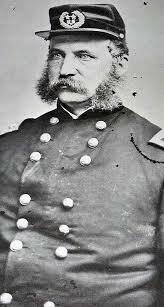 Colonel Brown, the commanding officer, promised to treat the “gentlemen. . . humanely.” (p. 164.) Rations improved immediately. After the first cold front of November, two lieutenants died. The 157th allowed their burial with military honors in the Confederate cemetery at Fort Pulaski. These were the last dignified burials allowed. Nor were families allowed to claim their dead. On November 19, 1864, the Union army selected 200 of the prisoners to move to Hilton Head, an island off South Carolina (p. 156). Lt. Cherry was one of this group. In December 1864, however, General John G. Foster, the Union commander of the Department of the South, once again ordered inhumane treatment. That happened because five Confederate prisoners selected for a special exchange had written to Colonel Brown to thank him and the 157th New York for their kind treatment. “[Y]ou have invariably shown us the courtesy of a gallant soldier and Christian gentleman,” they wrote (p. 171). Foster immediately had Brown reprimanded for allowing prisoners to thank him, and then reinstated the “retaliation” orders that, among other things, cut the prisoners’ rations to a quarter-pound of meat a day. (p. 171-20. The coastal winter turned bitter cold in December. The contingent at Hilton Head at first lived in tents on the beach (p. 184). They awoke one morning to ice on their tents (pp. 185-86). Ultimately, the Union army moved them into a jail in the town (pp. 186-87). Many of the prisoners had no blankets. Yet the Union jailers refused to issue blankets (p. 176). The damp cold and lack of fresh food brought on pneumonia and scurvy (p. 177). Treatment consists of feeding the patient fruits and vegetables rich in Vitamin C. But retaliation prohibited that, and the Union army surgeons had to treat the sufferers with opium, to which many became addicted. General Foster learned from Union escapees that Andersonville prisoners had received no food but corn meal and sorghum for more than a month. To retaliate, Foster ordered the Confederate prisoners to receive a diet of 10 ounces of cornmeal a day with pickles. Foster also banned the prisoners from receiving food or clothing from the outside. The corn meal, which has no nutritional value, had been processed in 1861 (p. 179-80). Sorghum was not available to the Union, and pickles were thought to guard against scurvy. But pickles are acidic and could not be digested by men on starvation diets. The difference between Andersonville and Fort Pulaski was that the Confederacy had no medicine and almost no food. The Confederate army had repeatedly attempted in the last year of the war to exchange or even repatriate their prisoners. General Grant refused, except in rare instances. “That the new ration will kill some is evident,” wrote Captain Henry Dickinson of the 2nd Virginia Cavalry in his diary. “It is said that this cruel order is Foster’s only. I should hope that the representative man of no nation would issue such an order” (pp. 180-81). The only way to receive life-sustaining rations under Foster’s order was to take the oath of allegiance to the United States. This most prisoners refused to do. (p. 182). By January, the prisoners were slowly starving to death. Nine prisoners died at Fort Pulaski (p. 215). Two more died at Hilton Head. Their compatriots buried them. The Pulaski prisoners first trapped rats and then cats to eat. Occasionally the Union guards furnished cats to the prisoners, or stuck pieces of meat on the bayonets of their rifles and proferred them (pp. 211-12). At last, on January 27. 1869, the Union restored normal food, and the prisoners drew four ounces of beef and four ounces of potatoes as rations. This was their first solid food in 44 days. In February, the guards permitted the prisoners to receive letters (p. 229). Seventeen of the prisoners, however, took the oath of allegiance to escape the prison. The other prisoners ostracized them (p. 237). On February 14, General Grant gave permission to exchange the Confederate prisoners. They boarded a ship that sailed up the Carolina coast and docked at Fort Monroe, on the tip of the Virginia peninsula at the mouth of Chesapeake Bay. City Point on the James River near Petersburg held the Union supply depot, and exchanges took place there. The Union army did not exchange the prisoners at City Point, however, perhaps because the newspaper reporters covering the war would observe their wretched condition. Some authority decided not to release them. “It was plain to us that our cause must before long succumb to superior numbers and resources, and in April, May, and June, the last Confederate had surrendered. Offers were made that if we would take the oath of allegiance to the U. S. Government, we would be released. We refused to until we knew all had surrendered. In all, 44 of the prisoners under retaliation died between September 1864 and November 1865. Most of them died from chronic diarrhea, scurvy, or dysentery (Appendix D, p. 290). The United States Army preferred no murder charges against General Foster for the starvation of these prisoners.